Each Ren(Team) has their own musical band. 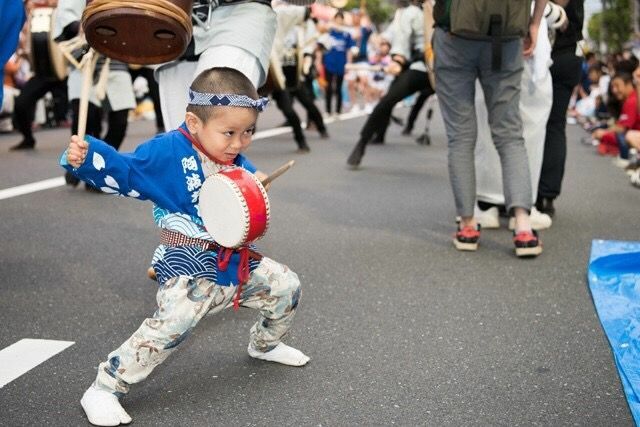 It is called “Narimono.” “Narimono” usually consists of some instruments such as the bell, drum, Japanese flute, and Shamisen(Japanese guitar). The “Kane”, which is the dish typed bell. The “Kane” player is the conductor of the band. He or she unifies the performers, including dancers. He/She sets the tempo, dynamics, and the beats. Other members always listen to the bell sound as an indication for them to start and follow the instructions. For example, when the bell player rings a slow and big sound, the other musicians will know if they will slow down with their beat. When the music becomes slow, the dancers will also start to move slowly too. The bell player takes control of the musical band and dancers. The drum also has an important role in the team. A dancer always follows its rhythms and make the steps. 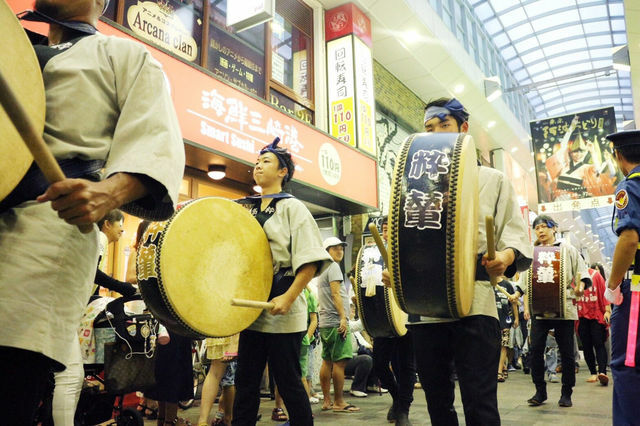 A big drum, called “Odaiko,” makes big and low sounds. A musician carries the drum and plays with two wooden sticks. 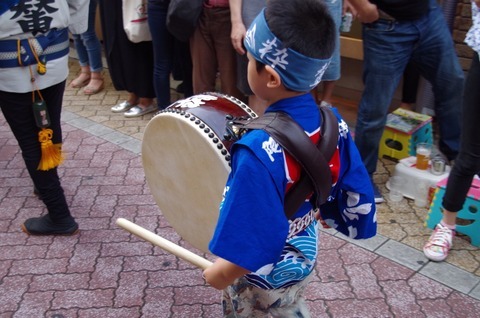 A small drum called “Shime-daiko” makes the high sounds. This drum creates an accent. Along with the Japanese flute called “Shinobue”, which makes a beautiful melody. 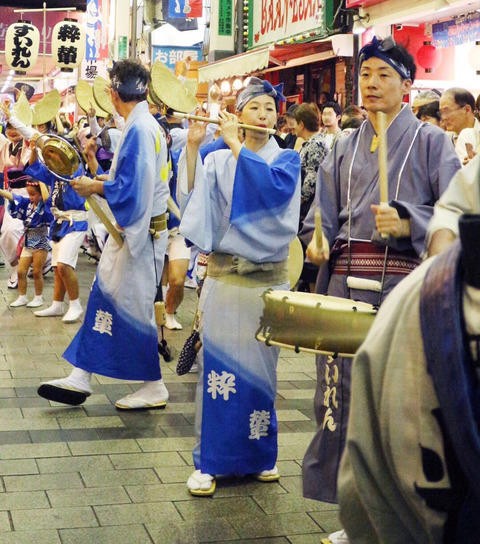 In Awa-odori, there are several typical songs. Each Ren(Team) has a slightly different melody line. When dancers compose their sequences, they sometimes follow the tune of the flute. If the song has a melancholy melody, they will dance slowly. 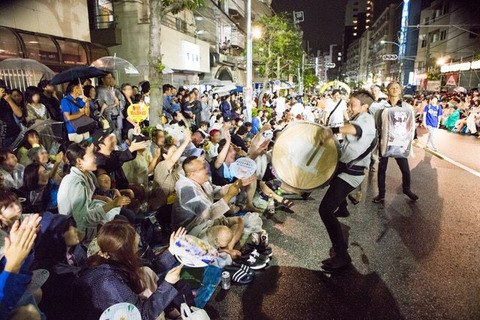 “Shamisen” is the different type of guitar. Shamisen can play melody, rhythm, and beats. It can add great accent in the music. 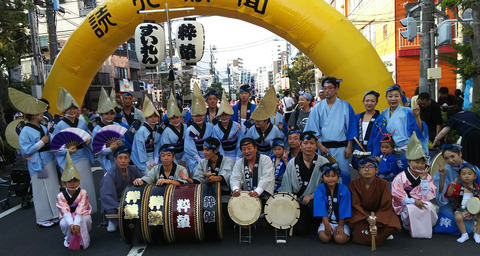 As for Suiren, Narimono consists of a bell, big and small drums, and Japanese flutes. What is the Kids Dance? 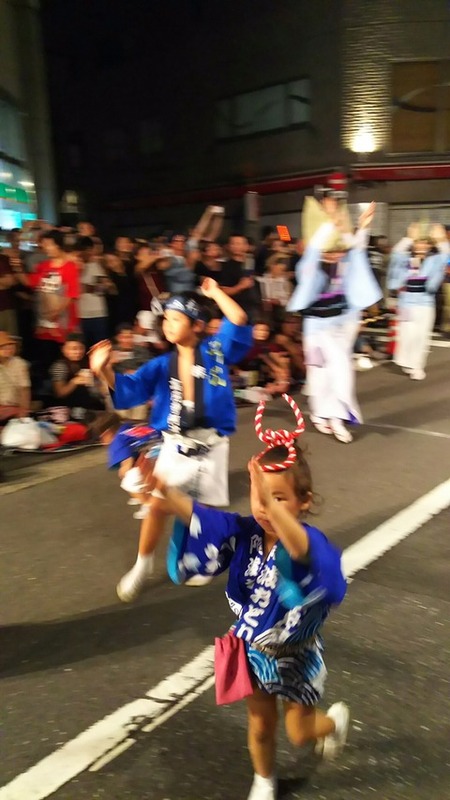 Kodomo means children, Odori means dance. The Ren (team) decides on which dance to learn first. Usually, the Ren (team) chooses to learn the Men’s dance first but it is still up to the Ren (team) on which dance they would prefer to study first. The costumes of the kids belongs to the Ren’s (Team’s) rule. For example, "Happi" and short pants. Happi is a short kimono that resembles a jacket. The girls' costume who perform the Women’s dance usually wear the women’s dance costumes. 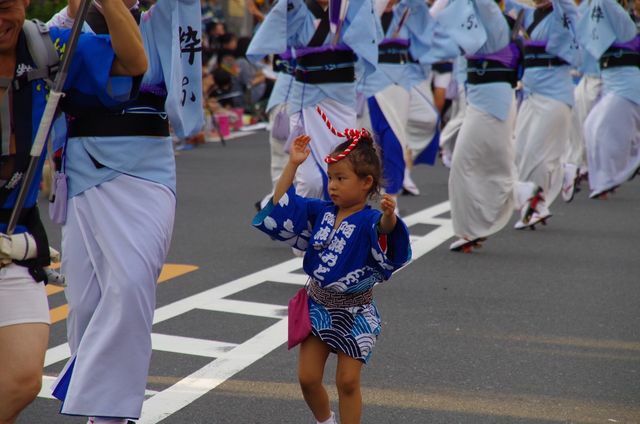 However, the color of the children's costumes sometimes vary from that and of the adults. As for Suiren, older women wears a blue costume and young girls wear a pink one. What Is the Men’s Dance? Otoko means men, Odori means dance. Men and women can join the Men’s dance. We can express ourselves through dance. The moves of great dancers are very smooth. 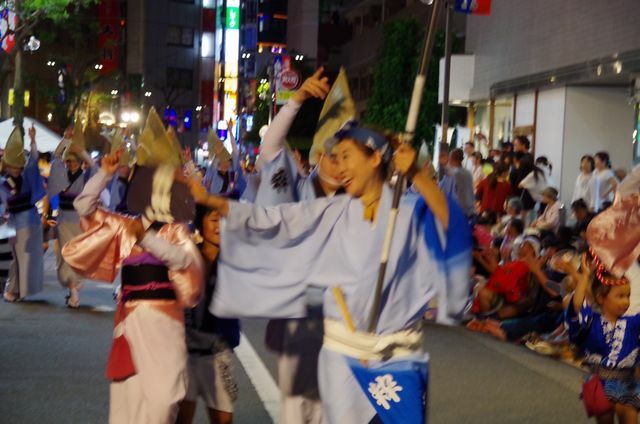 The “Otoko-Odori” that men do is sometimes aggressive, passionate, and comical. They dance gracefully. 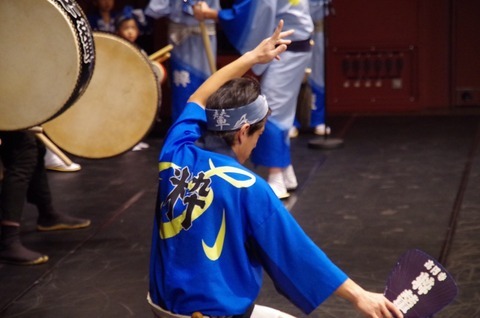 The dancers often dance with Uchiwa fans or Japanese paper lantern. The highlight of it is “Abare.” “Abare” means ramping. Abare is a dance move wherein men move in an aggressive manner that includes jumping and moving in big steps. Dancers shout aloudly during Abare. On the other hand, the “Otoko-Odori” that women do is elegant and smooth. The way to dance it is the same as that of men’s dance. Historically, women started dancing the men's dance more recently in the 400 year-history of Awa-dance. Some Ren (Team) have their own patterns with different sequences like the womens' dance that depends on the Ren. The dancers wear either kimono or “Happi” and short pants. The hem of kimono is tucked up to the waist to make the Kimono shorter. “Happi” is a short kimono, just like a jacket. 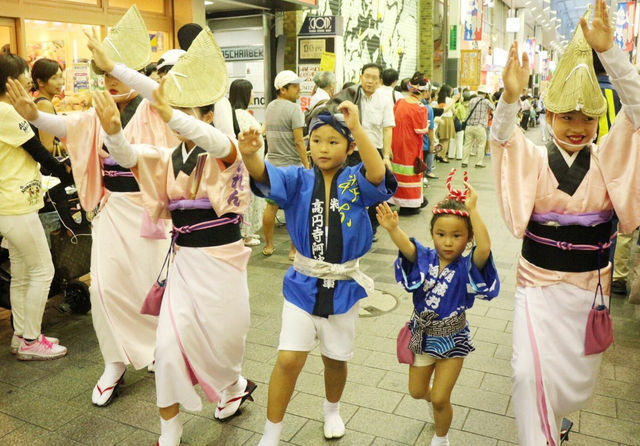 When a dancer wears it, a plain white fabric is wrapped around the body under the “Happi". They wear “tabi” socks. Their soles are very thick, so they can dance on the street. 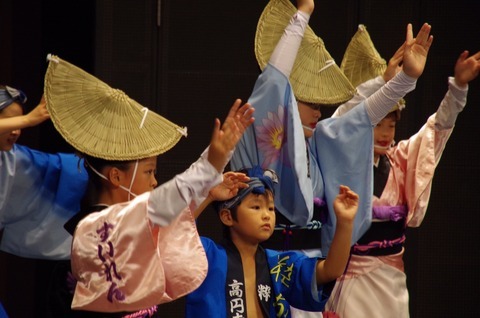 They put a Japanese towel (Tenugui) on their head. Sometimes, the men cover their head with it and tie its ends under their nose. Who can join the Otoko-odori? As for the Men's Dance, both men and women can join. 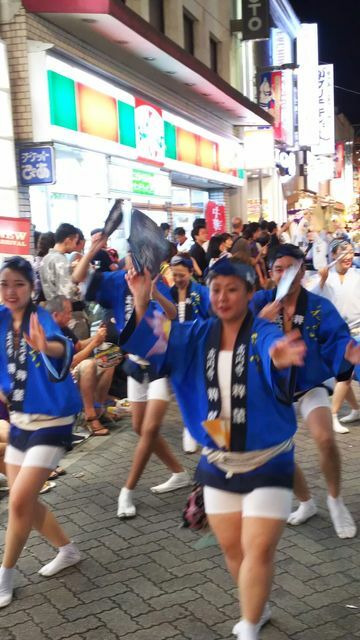 Usually, there is no age limit for the dance members. Happy New Year from Koenji! Happy New Year! Hope you’ll have a great year! Sui-ren’s first practice this year is January 29th from 7 p.m. to 10 p.m. at Koenji. If you wish to see us practice, and have a glimpse on how we prepare the dance, you can contact us!